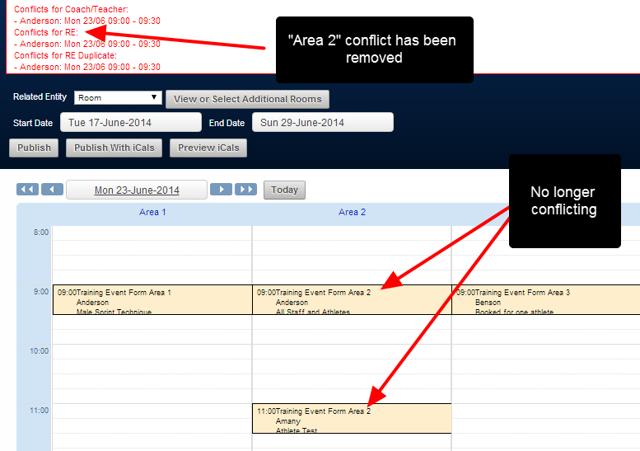 Conflicts can occur across different Scheduling Event Forms that use the same related entity, or if someone double books a related entity from even one Scheduling Event Form. You can see here that there are two entries made for the same Training Room record called "Area 2". Training has been scheduled at the same time. 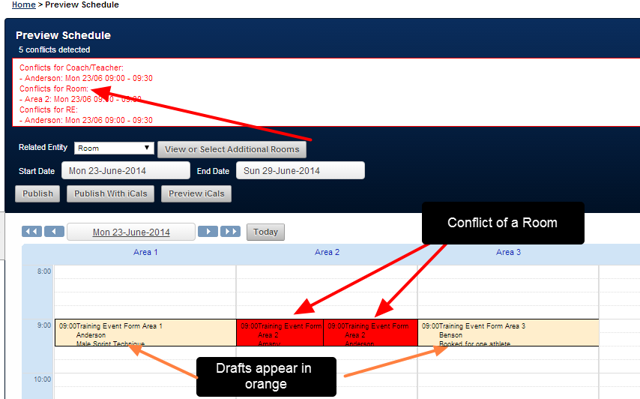 To resolve conflict for Draft events, the records must be changed so that they no longer overlap; open the form and change the time, or delete it. However, be mindful that if you have multiple Related Entity Types in a form, this may conflict with them as well! When a Scheduled Event is saved as a Draft, it will not appear on the Calendar of any of the users until it is published. This means, when a draft event is edited, it does not have to be marked as "Reschedule" or "Cancelled", it can just be updated and resaved as a Draft or Temporary file in preparation for the Schedule to be Published. 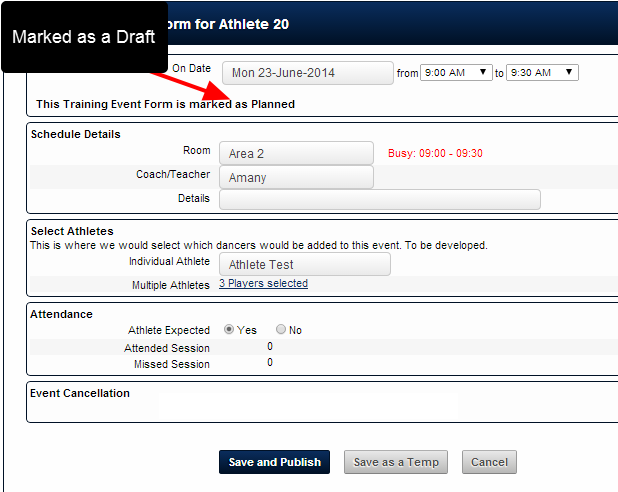 Any Draft Schedule event can be deleted from the system, but only if a users has access the data permission to delete that Event Form. 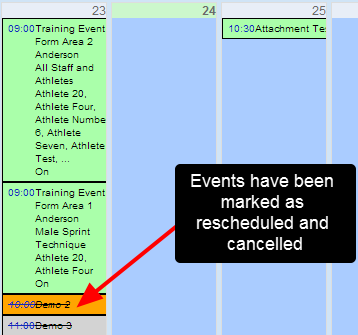 If Scheduled Published Events are conflicting, one of the entries can be opened and Cancelled or Rescheduled using the "Status" field. 1: Set the Status to "Cancelled"and it will appear in a different font colour with a line through it. 2: Set the Status as "Rescheduled" and it will appear in a different font colour with a line through it. N.B. Some organisation may just want to change the time and not notify users. Make sure you have a clear organisational workflows to ensure you cancel or reschedule events appropriately. The example here shows that these scheduled events have been marked as cancelled and rescheduled. 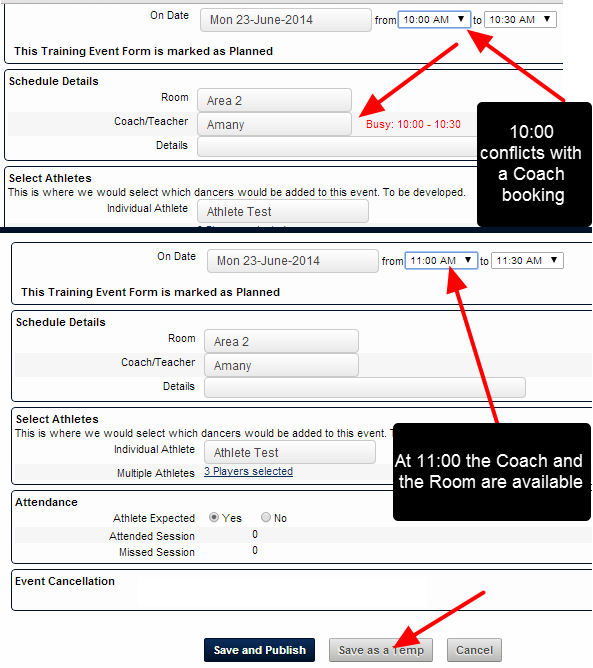 Some organisation's may just want to change a time and not track whether the event was cancelled. Make sure you have clear organisational workflows about managing scheduled or cancelled events. You may simply want to change the time or select a different related entity and not track status. These events don't appear in a different colour.